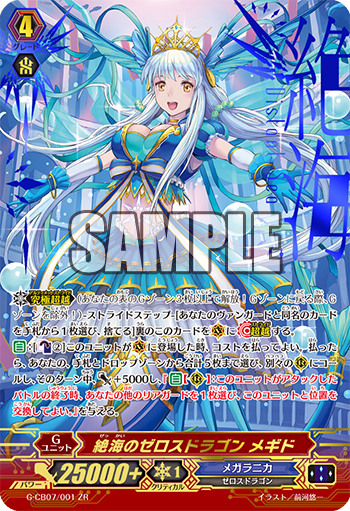 Today’s COTD are Megiddo and Grade 1 Shizuku as the reprints of the set. AUTO [Counter Blast 2] When this unit is placed on (VC), you may pay the cost. If you do, choose up to five cards in total from your hand and drop zone, call them to separate (RC) and until end of turn, they get Power+5000, and “AUTO (RC) At the end of the battle that this unit attacked, choose one of your other rear-guards, and you may exchange its position with this unit.”. AUTO When this unit becomes in harmony, look at five cards from the top of your deck, search for up to one grade 3 or greater card from among them, reveal it to your opponent, put it into your hand, and shuffle your deck.